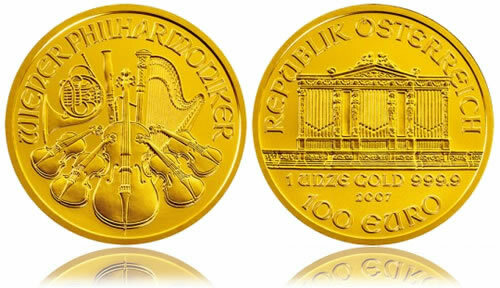 The Austrian Vienna Philharmonic Gold Bullion Coin made its world-wide debut in 1989 from the Austrian Mint. Since then, it has become one of the most sought after annual bullion strikes, at times even qualifying as the best selling cold coin in the world. A large part of the interest in the coin is based on their quality. Each is composed of 99.99% pure gold, making it one of the purest bullion strikes routinely produced around the globe. Another factor in its popularity is the subject matter showcased on the obverse and reverse of the coins. As the name of the coin indicates, the subject is the Vienna Philharmonic which can trace its roots back to 1842 and is considered one of the finest orchestras in the world. The orchestra was originally established by Otto Nicolai who formed the Philharmonische Academie. All of the decisions undertaken by the orchestra was decided by democratic vote, a process still followed today. The orchestra is so popular that it can take over a decade on a waiting list before an opening becomes available for season tickets. The obverse of the Austrian Vienna Philharmonic Gold Bullion Coin contains an image of the great organ of the orchestra which is found in the Golden Hall of Vienna’s concert hall (Musikverein).The organ was installed in the facility in 1907. "REPUBLIK OSTERREICH," the face value, size and purity of the strike are inscribed on the obverse. On the reverse, eight different instruments used by the Vienna Philharmonic are shown along with the inscription of "WIENER PHILHARMORIKER" for "Vienna Philharmonic." Of note, in 2002, the Philharmonic Bullion Coin became the first to feature a face value in Euros. Previous strikes featured the face value in Austrian Shillings. Of course, the face value is purely symbolic as the coin’s melt value is where its true value is located.